Dear Home and property owners, When you need the best restumping Melbourne based service, you need a company who can take care of all your needs. We provide exceptional house restumping services . If you require quality service that you can trust and who can provide you peace of mind that your foundation will be taken care of the right way, we can bet you won’t find a better team of reblocking Melbourne contractors than us. When many homeowners think about their house’s ​foundation, the common choice is a concrete slab. However, a popular foundation choice for homes, particularly In Melbourne, is stump subfloors. With stump subfloor foundations, any home can built, even on a sloping surface. Even close to the coast, a house can have a solid foundation with either concrete stumps or wood stumps. ​However, eventually your bayside home is going to need reliable foundation repair. Over time, your home’s leveling becomes off, causing your home to slope to one side. Without quality releveling by great local floor restumping specialists, you are risking significant damage to your foundation and home. Finding house restumping in can be a challenge. Most homeowners only concern themselves with finding cheap providers. However with discounted services either the restumper is inexperienced, or they don’t worry about offering quality. Before you know it, your home requires yet another reblocker to fix your foundation needs. ​Many contractors only worry about getting through your job as fast as possible. They don’t take the time or effort to make sure that your domestic reblocking are met the proper way, preventing future problems from arising and keeping your home safe and secure.But using our company means you’re always getting the best service possible. ​As time goes on, your wood or concrete stumps can either sink into softer ground, or they can chip or rot away. This is especially true if your home is on the coast where the salt air can cause wooden stumps to stay moist, growing mold and mildew. The rotting stumps will cause your home to sink and sag, and if left untouched can eventually cause significant damage to your home. Unfortunately, many homeowners wait until it’s too late. Because the homeowners are worried about high restumping costs house owners may not act as quickly as they should. It can be understood why they may want to hold off; a lot of restumping companies charge a fortune to fix your home’s foundation. We offer the best value for your money. With fast, reliable service, we can make sure your home is secured. Underpinning is what many homeowners want when their home begins to tilt, sink, or lean. Replacing or repairing your stump subfloor foundation shouldn’t be a challenge for reblocking companies. The process is not a difficult one; as long as you have the know-how, the right tools and equipment, and the right experience. It starts with our team inspecting your floors with a level. 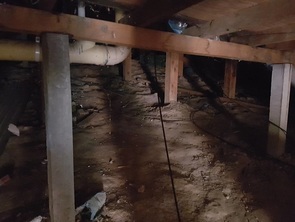 By checking the floor level, we can determine just how severe the slope of your floors and subfloor has become, and whether or not it’s a danger to your home’s structure. You may not even need to have restumping performed just yet if it is determined that your slope is within the acceptable range. The next step is to inspect your wood or concrete stump subfloors and foundation. We will inspect them for wear, tear, water damage, and other contributing factor that may have caused them to rot away or sink further down into the soil below. If we discover that your concrete stumps have begun to crack, or that your wood stumps have started rotting away, the final step for us is to use a series of jacks to support your home while we remove and replace your damaged stumps one by one. As the owner of the home, you do have the option of only replacing the stumps that are the most significantly damaged. However, our recommendations are almost always to go ahead and replace all of your subfloor’s stumps. Having fast and reliable company ,the cost is never as high as having the job partially done. Only replacing some of your damaged stumps leads to keeping your home at risk for structural damage, and your reblockers will just have to come back. When that happens, you’re paying for the same service twice. We always make sure that you get the best recommendation that suits your home’s needs the best. We will never oversell you anything which is not required, and we always have your best interests in mind. We never replace subfloor stumps we don’t have to, and we always make sure the ones that do need to be repaired or replaced are taken care of quickly and easily. This way, we always make sure that you get the best prices over any other restumpers . While looking for quality for your home, you should look for a company that has the best reviews that won’t cost a fortune. Of course, if you’re having stump subfloor or foundation issues, you’re going to need more than just reblocking. Search for the best choice in underpinning Melbourne as well. Hiring us, means you have access to the best foundation repair services around. Underpinning is a related service that involves treating the soft soil in which the subfloor stumps are built into. By stabilizing the soil under the home, you can prevent your wood or cement stumps from sinking or slanting further. This way, after we finish the job your home is prevented from future subfloor issues. You can have us provide you with the best quality no matter where in Victoria you live. Whether your home is in the western or the eastern suburbs, we will be there for you. We also serve eastern, Northern Suburbs, South East Melbourne, Bayside and the surrounding areas. No matter where you live, east, west, north, south, you are closer than you think to us. And other issues with your floors or walls. If your home requires underpinning, you have enough to worry about with the costs of your repairs going out of your budget. Your schedule is hectic enough that you don’t have time to wait around forever for the restumpers to show up. If you require quality, reliable underpinning work done for your home, there’s only one choice that more people rely on. We’ve been providing all communities of the VIC with quality underpinning services for a long time. Our experienced team knows exactly what to look for in your home to quickly identify whether or not floor and foundation repairs are necessary. We also know how to find issues with the soil where your stumps are, we can reinforce the area below your home to ensure it stops shifting and making your home slant, slope, or pull apart.